This tiny hangout relishes in diversity. Co-founders Dave Stewart and Adrian Ravinsky take inspiration from Toronto’s melting pot of cultures to deliver a bevy of foreign snacks to your plate. And the top contender? It’s their steamed pork bun. It’s a simple dish but there’s something about the texture that has us ordering more. 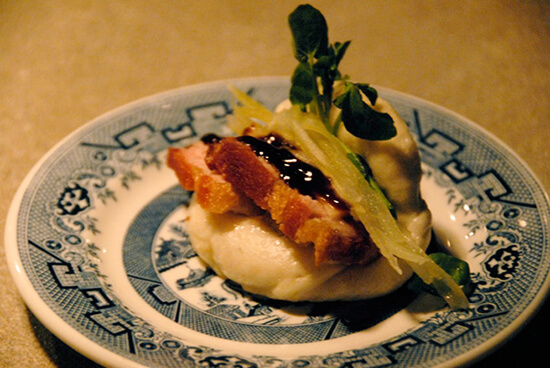 The steamed bun is deliciously sticky, wrapped around tender pork, topped with hoisin sauce and veggies. And, with Dusty Gallagher working in the kitchen as the Executive Chef, you know you’re in for some tasty meals. He’s had stints on Top Chef Canada and Iron Chef America – a true testament to his talents. 416 Snack Bar can be found in Bathurst Street, and to score a seat I recommend arriving early. Comfort food at it’s best, Le Petit Dejeuner is well-renowned in Toronto as one of the best all-day breakfast locales. The authentic Belgian waffles are a must – consisting of organic maple syrup, waffles and your choice of toppings. I went for the Brussels’ Melody that includes peameal bacon and one scrambled egg. Be sure to score a seat early, as Grand Electric’s answering machine will tell you: "We don't take reservations and we're closed on Tuesdays so we can get drunk." 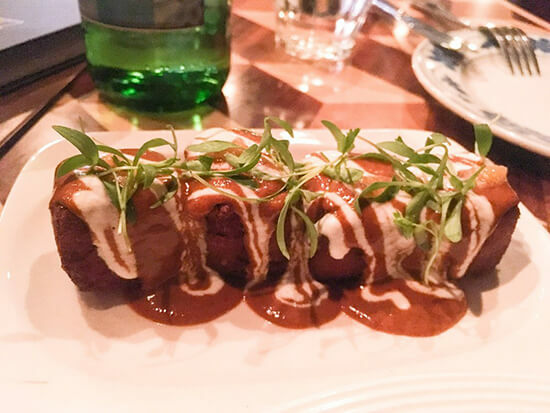 It’s this honest and laid-back attitude that transcends to Grand Electric’s food offerings and what gives this restaurant its happening atmosphere. Casual diners chat over pumping hip hop while they tuck into some of the best tacos in town. The winning combination of beer battered tilapia, morita salsa, lime mayo, cabbage, cilantro and radish is an obvious crowd-favourite and one that has to be tried. 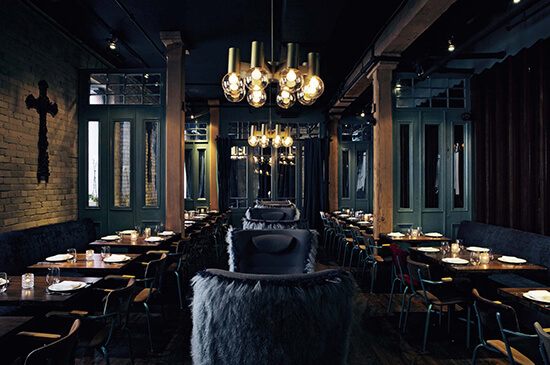 This hip locale is the lovechild of renowned chef, Susur Lee who cooks up the modern cuisine and his wife, Brenda Bent who designed the gothic-like restaurant. What’s more interesting is that hip hop star, Drake is involved with the restaurant - but to what extent, no one knows. And just like the incredible talent behind the restaurant, the food is just as impressive. It’s a share menu so getting a taste of majority of what’s on offer is advised, in particular the bao chicken sliders. Lee has taken the best ingredients of a cheeseburger and popped it into a soft bun resulting in the best bao you’ll ever lay your hands on. A South American-inspired hole-in-the-wall serving sandwiches in one of Toronto’s most happening neighbourhoods. Much like the eatery itself, Leslieville is all things cool and hip (and conveniently located just up from The Beaches). 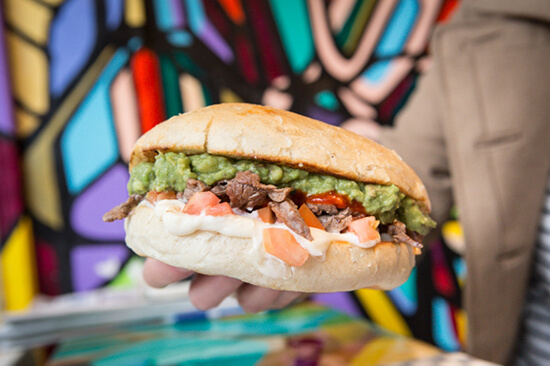 The classic South American street sandwich, churrasco contains your choice of griddled meat (steak, chorizo or pork), mayo, diced tomatoes, smashed avocado, house hot sauce and red pepper sauce. Yum. This café is conveniently located a short stroll up Queen Street East, so once you’ve dusted off your lunch at Completo, check out Purple Penguin for dessert. 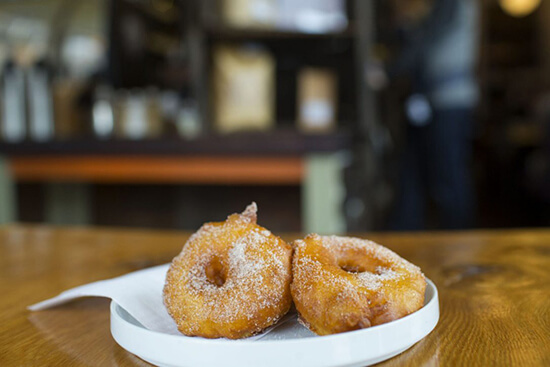 This spot has all the obvious offerings that make any café, but their apple fritters are what you want and need. Inspired by Korean street food, the apple fritters are made fresh so be prepared to wait a few before being served. The apples are deep fried and rolled in sugar – simple and delicious. Consider getting them to takeaway and go find a cosy spot to munch on these divine creations; there's a park behind the café. Deviate from your regular bacon and eggs breakfast and order the fried duck eggs with chive and wild mushrooms ragu at this sweet little French bistro. 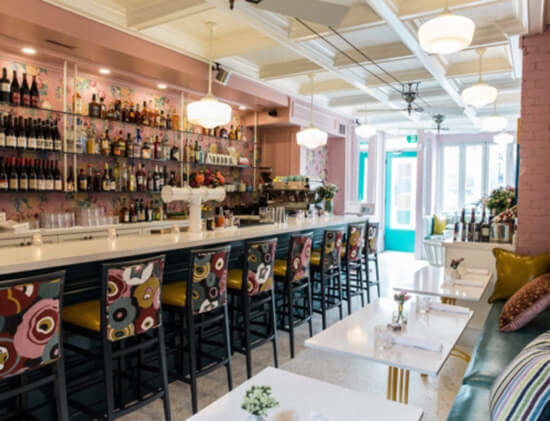 With its sun-dappled space, pastel interior and high-energy service – Café Cancan is all things light and cheery. Peoples Eatery brings you food cultures from all corners of the city to this one cool little hangout. The menu is comprehensive, ranging from snack-sized dishes to larger platters. It’s a tough decision landing on just any one meal at Peoples so, to make it easy, I highly recommend the butter lamb croquettes. They’re deliciously crispy on the outside, soft on the inside, and come perfectly paired with apricot chutney and yoghurt. Eat your way around Toronto and the more of the East Coast on our Toronto & Niagara Journey. Make an appointment with a Travel Expert today to chat more about Canada. Born and bred in sunny Brisbane, for Sophie home is where the heart is but that doesn't stop her from skipping between island paradises and regularly jetting off to incredible overseas destinations. She's a coffee-guzzling addict with a love of Vietnamese street food.